CSI Laboratories is a specialized cancer diagnostics laboratory focused specifically on meeting the unique needs and challenges of pathologists and the patients they serve. CSI Laboratories is independently owned and operated by medical professionals, and has provided reliable and expert diagnostic testing to pathologists across the United States since 1997. For over 14 years, CSI Laboratories has provided pathologists and clinicians with the diagnostic expertise they deserve. CSI Laboratories was founded in 1997 as a flow cytometry laboratory with the specific goal of serving the regional community as a dedicated resource for this specialized testing. From the beginning, CSI Laboratories has held client service and patient care in the highest regard. In 2005, CSI Laboratories expanded its product offering by opening its cytogenetics and molecular genetics (FISH) laboratories. 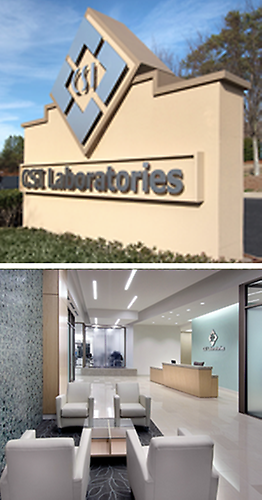 To compliment these core services, CSI Laboratories built an extensive immunohistochemistry laboratory in 2007. Together with its focus on serving the pathology community and passion for patient-care, CSI Laboratories provides nationwide specialized diagnostic testing aligned with our original mission. We will not base testing decisions on a patient's ability to pay.